Earth Hour started in 2007 in Sydney, Australia when 2.2 million individuals and more than 2,000 businesses turned their lights off for one hour to take a stand against climate change. After only 1 year, Earth Hour had become a global sustainability movement with more than 50 million people across 35 countries and territories participating. 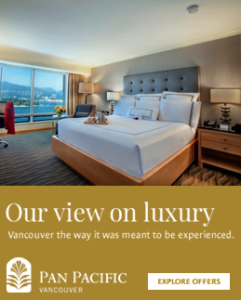 On March 26 from 8:30pm – 9:30pm, the Pan Pacific Vancouver will shut down all power and lights that are not essential to our guests and associates comfort, safety, security and operations. The Pan Pacific is participating in this event and is inviting our guests to join us in our Atrium Lobby and Cascades Lounge to enjoy a very special candle-lit ambience and listen in on live opera entertainment unfolding at Café Pacifica’s Italian Opera Buffet. We encourage our guests to participate in this meaningful cause by turning off or dimming the lights in their guestrooms between 8:30pm to 9:30pm on March 26th. As an added treat, the Spa Utopia has teamed up to provide guests with a 100% organic, purely Canadian Mud Bath in the privacy of their own rooms. Choose from Moor Mud Chocolate, Moor Mud Pine, or Moor Mud Lavender. Spa Utopia Moor Mud products help to restore the body’s natural balance by encouraging detoxification. The mud’s high humic acid content acts as a natural anti-inflammatory helping to reduce pain and muscle aches, minimize joint inflammation, and control cellulite. And it feels great! And remember, if you enjoy the free trial, bring the empty 100ml bottle downstairs to Spa Utopia for recycling on Sunday March 27th and receive a 10% discount on a larger 16 or 32 ounce size.